THE NATIONAL YOUTH TEAM (Under 16) were the proud recipients of 10 Coca Cola footballs for their practise sessions in preparation for the upcoming Confederation of North Central American and Caribbean Football Associations (CONCACAF) Youth tournament. The tournament is to be run off here in August and September of this year as part of the Trinidad and Tobago Football Association's Diamond Jubilee celebrations. 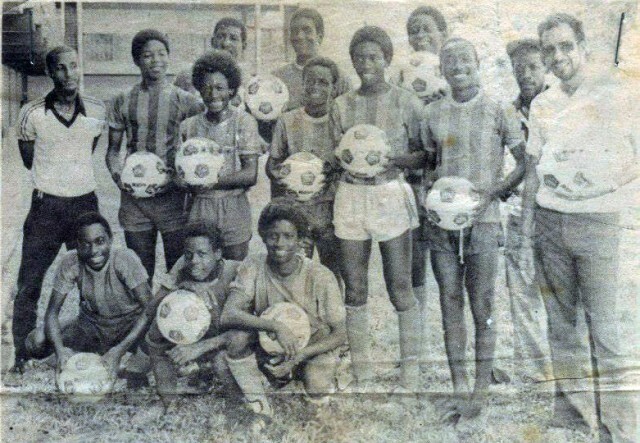 In the picture above are from left (FRONT ROW) T. Willis, D. Forde, A. Jacob, and Leslie De Souza (extreme right), director of Canning Foods Limited, the firm that donated the balls, (MIDDLE ROW) Muhammad Isa, coach, (extreme left), B. Smith, assistant coach C. Osbourne, R. Latapy, C. Lee, S. Besson, M. Faustin, and (BACK ROW) A. Clarke, A. Weekes, and G. Grant, equipment manager.